1. Amodel's 1:72 Ka-26 'Hoodlum' #7240 comes on five sprues of pale-grey limited-run plastic running to about 135 parts, with fine engraved panel lines where appropriate. There are a lot of very small external details such as rear-vision mirrors, exhaust pipes, windscreen wipers, and so on. 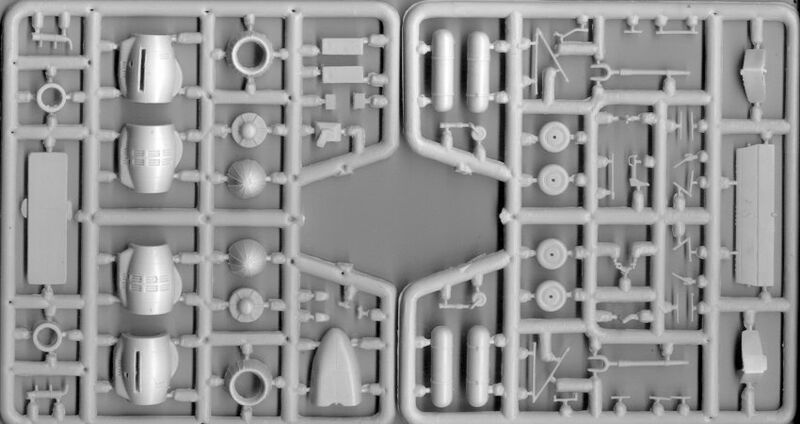 A sixth sprue carries the clear window parts, which look close to top quality. 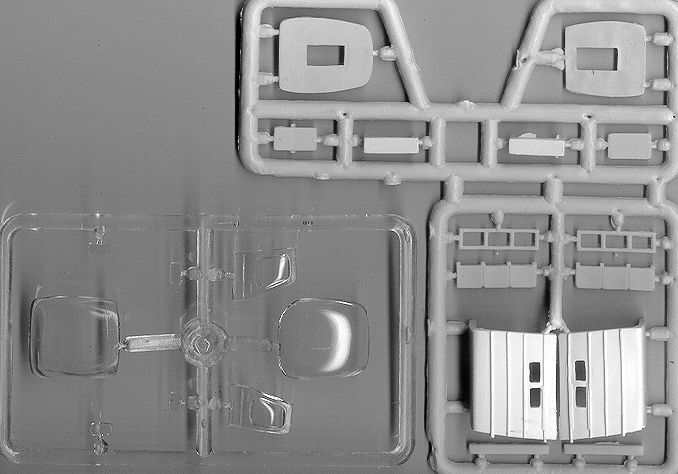 All the parts making the passenger cabin module are on a single sprue, with strap-on external tanks included as an option. It seems highly likely that variants of this kit will be issued in the future with alternative configurations such as crop spraying or freight palette modules. 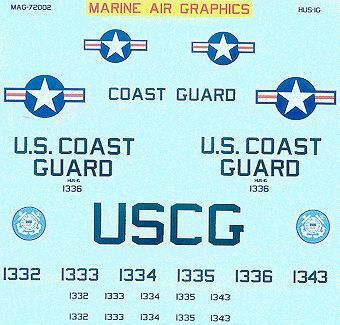 The decal sheet also carries the serials for CCCP-26184, which is presumably an alternative for one of the first two schemes. 2. Amodel's latest variant of their 1:72 Ka-15M (#7277) contains the same parts as #7242 and #7256, plus one additional sprue carrying a set of floats, a large drum-winch, an anti-submarine sonar device, and all the related support brackets. The orange and white scheme is the same as for #7256, as are the Aeroflot decals, presumably because this equipment was fitted to the same aircraft. This kit was previously advertised as a Ka-15MG, but that designation has not been used on the released packaging. 3. Fujimi have released their 1:72 KV-107 'Hyakuri Rescue JASDF 40th Anniversary' #72130. The boxart picture at HLJ doesn't tell us much, but it appears that part of the decoration is a large blue bird, possibly an eagle. 4. JB Models have released a 1:76 (HO scale) kit of the 105mm British L118 Field Gun / US Army M119 howitzer, as often shown dangling below RN Commando HC.4's. The guns are packed two per box (#1011). 5. Cobra Company's masters for their UH-60L and MH-60L update sets are finished and being cast, while masters for a UH-1C backdate to the 'B' model are underway. These will apparently be available in all applicable scales. Cobra also have a complete 1:48th H-25B / HUP2 just about ready, for release this coming summer. 6. Hannants now seem to think that the long awaited 1:72 Legato resin #00372 PZL W-3A Sokol helicopter will be with us quite soon. It has re-appeared in their Forthcoming Releases section, this time with a boxart picture. 7. 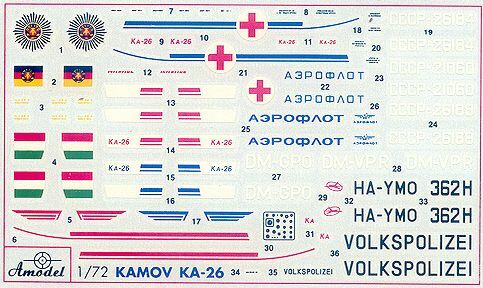 Maquette have released a 1:72 Kamov Ka-25 'Hormone', #7252. 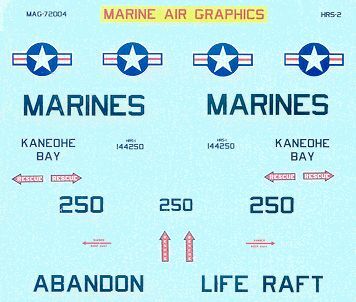 Given that this comes with decals printed by Amodel, it seems likely that it is derived from the Amodel/Skyhigh Ka-25 kit. 8. The MPM / Special Hobby / Azur group have announced that they will release a 1:72 plastic & resin Cierva C.19 autogiro and a 1:48 plastic, resin and brass Fa.223. It is not clear which kit will appear under which of these labels. 9. 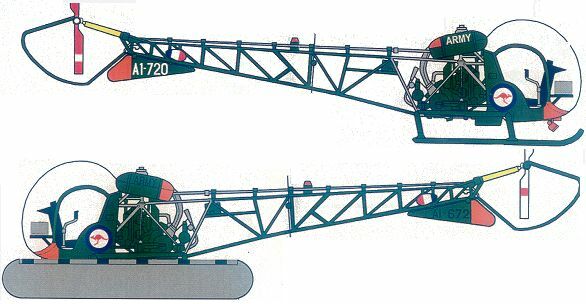 Planet Models have announced a resin & vacform1:72 Fw 186 autogiro. 11. 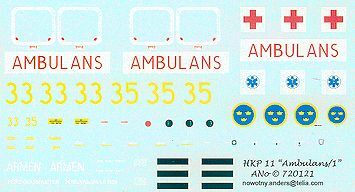 Anders Nowotny has produced a nice set of decals (#720121) for the Swedish HKP11 (AB 412 Ambulance). 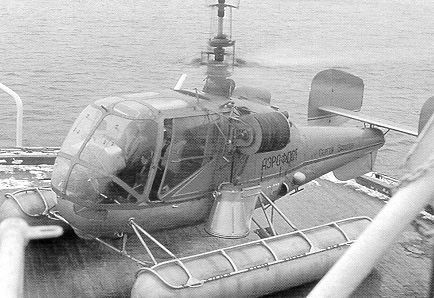 The sheet comes with serials '33' and '35' and with titles for the 'Armen' and for the 'Forsvarsmakten' (Combined Helicopter Force). The red circle goes on the underside. 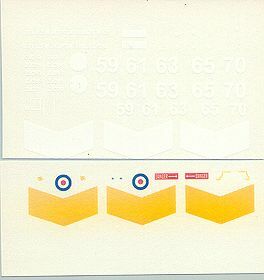 These are available direct from Anders Nowotny, or from Ted Burnett, leader of the Swedish Air Force SIG. 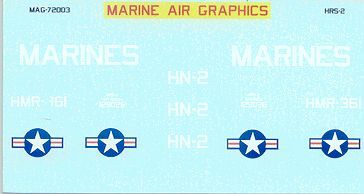 MAG-72001, the USMC H-34, was illustrated in HKN #133. HUS-1D, ET 44, USMC. The recovery aircraft for Alan Shepard. 1:72 a pair of Agusta style pilot seats for Agusta Bell Hueys, etc. 14. 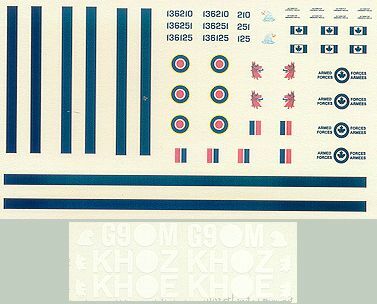 Model Alliance decal sheet #AA-07 appears to be the same as the recently announced sheet #AAF-72046. The Model Alliance/Aviation Workshop/Hawkeye re-numbering exercise is still shaking down, it seems. This sheet covers a number of different Bell 47G Sioux that served with Australian Army 161 Reconnaissance Sqn. 'Possums' between 1965 and 1968. #UK-7231 has markings for five different Defence Helicopter Flying School AS350 Squirrel HT.1's from Shawbury, UK in 2001. 15. Polygon-Press have released a second volume of their 'Kamov OKB' book, this one dedicated to the 100th anniversary of the birth of N.Kamov. The 3000-copy book is well illustrated but contains only Russian text. More details at Aviapress. 16. Ciro models have a new web site. The English language version isn't ready yet, but 'Katalog' isn't too difficult for me to understand. The less obvious link 'Podklady pro stavbu' leads to a very interesting collection of Mi-8/17 reference pictures. Thanks to Matt Bacon, Tony Morgan, Anders Nowotny, Geoff Arnold, Earle Martell (NKR), Yevgeny Borissov, Geoff Ruzgar, Petr Zaoral, Gary Dobias (Marine Air Graphics), Chris Miller (Cobra Company) and Gary Madgwick (Model Alliance).